Kshama Sawant is the future. Yes today’s so-called Dems may abandon her – she is a pioneer and today’s Dems are establishment entrenched – but there will be more of her, many more. By the way, saying the Democratic party is “establishment entrenched” is not an insult per se, it’s only another way of repeating what I have heard many Dems say they/we should do, “work WITHIN the system to change it” etc. Which, naturally, is what Sawant has had to do, Bernie Sanders as well. But the restrictive “party lines” of the two party system that have begun to look increasingly alike on everything but social issues demand that the majority of us, who don’t fit ourselves into pre-fab molds easily (that USED to be rags like the Stranger and activists like Dan Savage, but “they got theirs” and things change), push for system reform. That is what we’re doing by backing Stein. At this point, we don’t expect her to become president. But the primaries have taught us that we cannot move forward unless we activate the many different voices, and quit restricting the ways they have of expressing themselves while propping up the myth that we can get any truth from the so-called “mainstream” media. When journalism has died (I’m talking to you, Stranger, you’ve lost your edge and cannot win it back by dropping F-Bombs) we have nothing but biased editorials, masquerading as information, but offering only conflicting versions of events told from single points of view. Is it any wonder that nobody can agree on anything, even the facts of an event captured on video? I’m glad that some have finally figure this out. First…I am not a “so-called” Democrat; I’m a Democrat. And I don’t wear the label of Democrat like a religious belief; I am Country and values first, not party. I’ve concluded, after much research, introspection and life experience that as a Progressive, the best path forward, today, in this Country, is by way of the Democratic party. My point being, I take a backseat to nobody regarding the bona fides of my progressive values. Not Kshama Sawant, not Bernie Sanders, and certainly not Jill Stein (who?). I appreciate your attempt to moderate the usage of the word “Entrenched.” It’s a silly word applied simply to distract. It’s not a question of working either within or outside of the system. The “system” is Constitutional Representative Democracy as currently exists in the United States. The point that it is imperfect is well understood by anyone who has studied history, read political philsophy and/or sought to understand the fundamental principles of human governance. As is frequently said, Democracy is the worst system, except for all the rest. We can talk at length about the relative benefits of Democratic or Socialist rule, but that’s not my point in this piece. Even if we had a viable multi-party system, Ms. Sawant would need to build coalitions to have a voice. Imagine that Bernie Sanders were leading a third-party, but still received less support of the peole (votes). He’d build a coalition government with the Democrats, and Hillary would still be the nominee. In such a system, it would make little sense for Bernie Sanders (or Kshama Sawant) to completely alienate those who most closely share her values. We’d be in a coalition. But Ms. Sawant has lost sight of our shared values. She’s reserved the vast majortiy of her ire for the Party I belong to. She’s innacurately described my party and my values. She’s seeking to harm the candidate with whom she is more closely aligned, to the benefit of the candidate who is dramatically out of step with her own values. Ms. Sawant has made it clear that she has no respect for the Democratic party or for those of us who have supported her in the past, despite the fact that I and others have dramatic disagreements with her and the viablitiy of her ideas. I consider my views to be much more progressive than those of Ms. Sawant; primarily because I’m working to get actual progress made. 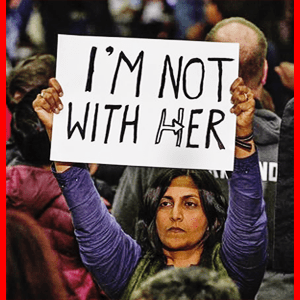 Ms. Sawant and many of her supporters compare the Democratic party and Hillary Clinton to a fantasy party, a fantasy candidate and a fantasy Country. As I said, I’m fine supporting her insofar as there is an understanding of mutual respect. But at the moment, I see no reason to continue that support. As I stated above, I’m fine making coalitions with those who share my values. We don’t have to agree on everything. I stand by my previous choice to support Ms. Sawant in her first election (she’s in a different district than mine now). But Ms. Sawant has seemingly confused that support then with current support now. Ms. Sawant is seemingly unaware that we can do more together than apart. And insofar as she refuses to acknowledge our shared values, insofar as she continues to misrepresent the Democratic party and our Presidential nominee, then not only will I no longer support her future as a Seattle City Council member, I will actively work to defeat her at the next election. Another thought…re: voting for Stein when you agree she can’t win. Party building happens bottom up. Running a candidate who has zero support in Congress, zero support in states (governors, mayors, etc. ), is simply an exercise in vanity. It’s vacuous. If you and others are serious about building a new, better party, then do the hard work on the ground. As an example, here in Seattle, I just voted in the August primaries. There were 76 candidates on my ballot running for several political offices. Not ONE was a member or the Green Party. Not one. By comparison, six were from the Libertarian party. So, let’s be honest: the Green party is not a serious effort to build a better political system. It’s a PR stunt that uses the the silly idea that you can advance your cause by losing badly. You can’t. You have to win, and build upon that. And that misguided PR stunt comes with the risk of harming the viable candidate who most shares your values and rewarding the candidate who least shares your values. Further, if Trump were to be elected, you’d spend more energy opposing his policies than you would building your own movement. And that’s completely counterproductive.